Ursula and Severo eloped in Sedona. 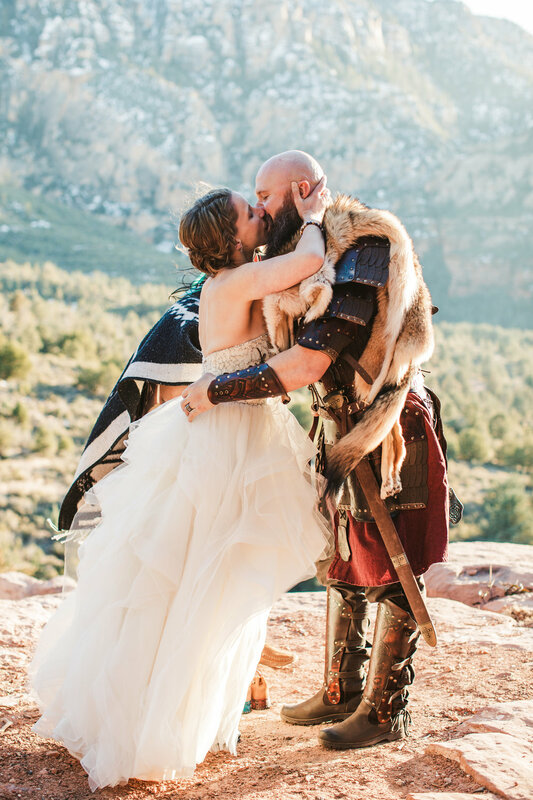 But it wasn't your average Sedona elopement. It was a bit of a Viking elopement. For real. Sev's got some Viking blood. So instead of a suit and tie he went with a suit of armor. And a sword. I love working with couples that march to the beat of their own drummer and Ursula and Sev do just that. We jumped in the back of Pink Jeep for a ride up to Merry-Go-Round Rock where the two planned to get married. Along the way we picked up Mario Blackwolf, from the Mechica Apache tribe, who performed their wedding ceremony. It was a spectacular evening with a fantastic Sedona sunset. Congratulations again, guys! Enjoy!